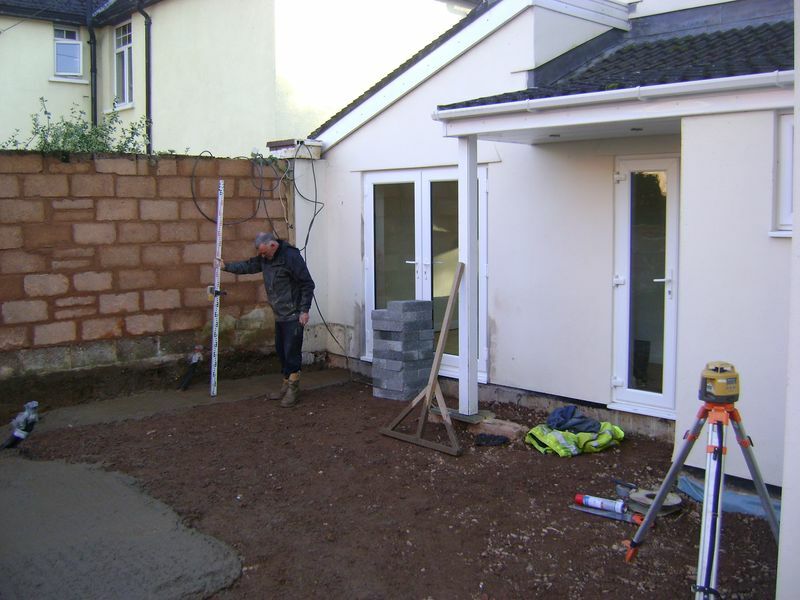 Whilst one member of the team sets about mixing the concrete, 5;1 ratio, for the feature walling and outdoor kitchen area, the other moves 5 tons of building sand from the front garden to the rear, this is covered as I dont want the sand soaking wet when I start the block work walling on Monday. 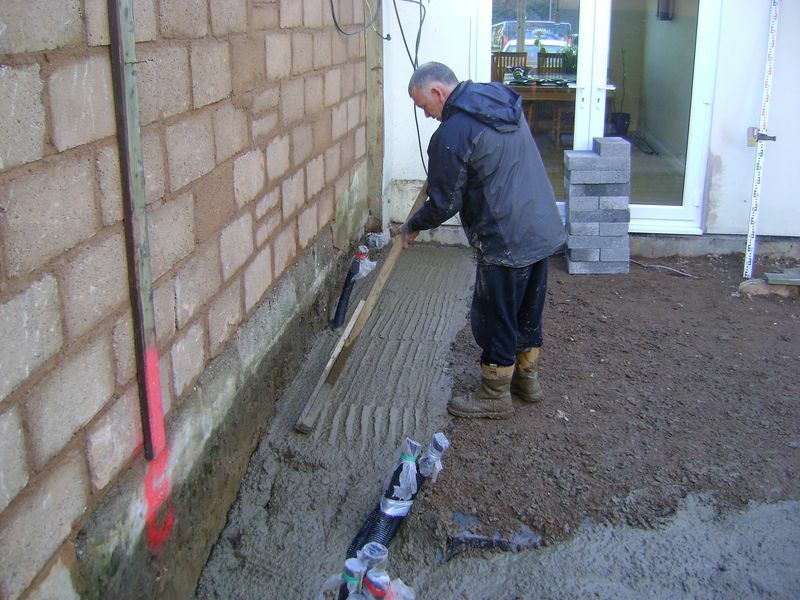 Mixing concrete near the property can incur small splashes of motar on the walling or surrounding areas. The heavy rain a couple of days ago also left alot of splash backs from the sub grade. My ethos is very simple, Your property and your landscaping garden build will be treated as if it were my own. I’m religiously clean at all times so there’s no unsightly marks of any kind left on the property or any of my tools, each day cleaning will occur. No client past or present has or will walk onto my project and trip over stray materials or put their foot on a piece of wood which hasn’t been de-nailed, etc. Yes we do make a mess, of course we do, I have to pull your gardens, landscape projects to pieces, its a controlled mess if that makes sense. 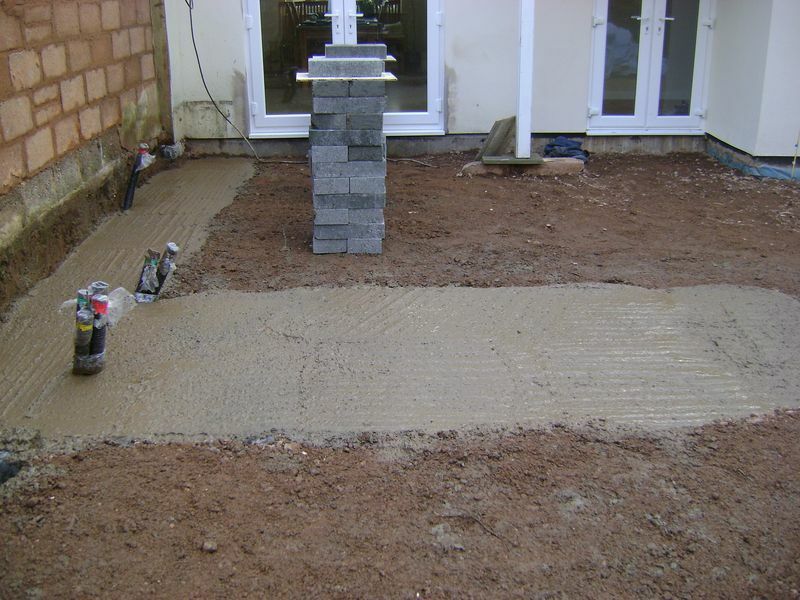 The 360 degree laser level has been set to top of concrete, the laser makes life so much easier, years ago this concrete levellling would have been done by means of a spirit level and plastic float. 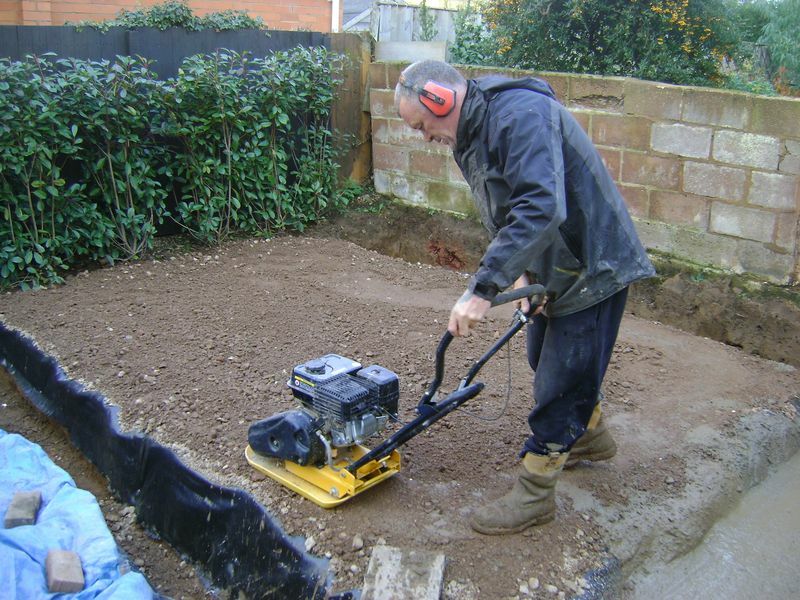 Once my concrete has been levelled I tamp the area, this tamping motion does not need to be a hard tamp causing concrete to be splashed every where, I hardly bring the base of the tamp off the concrete, this will cause a wave motion in the wet concrete and therefore give me a consistant level across the entire area. 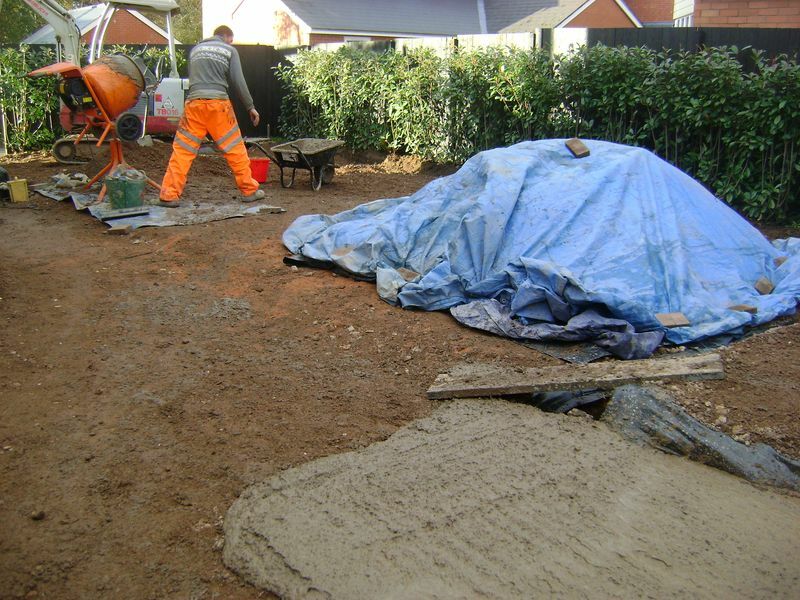 Remember, the more you play with concrete the wetter it becomes…. when finishing concrete or power floating this could be the difference between going home at 8.00 pm or 4.00 am, all because the fat was brought to the surface, get it in, level it, tamp it and leave it alone. 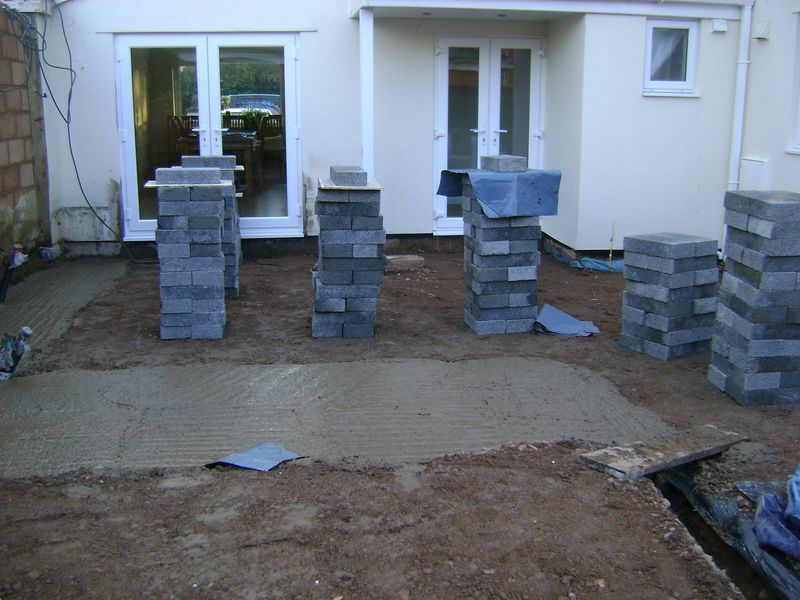 The levelling and tamping of concrete will save me time once block works commence, theres nothing worse than bumping up or grinding down the first couple of courses of block work. 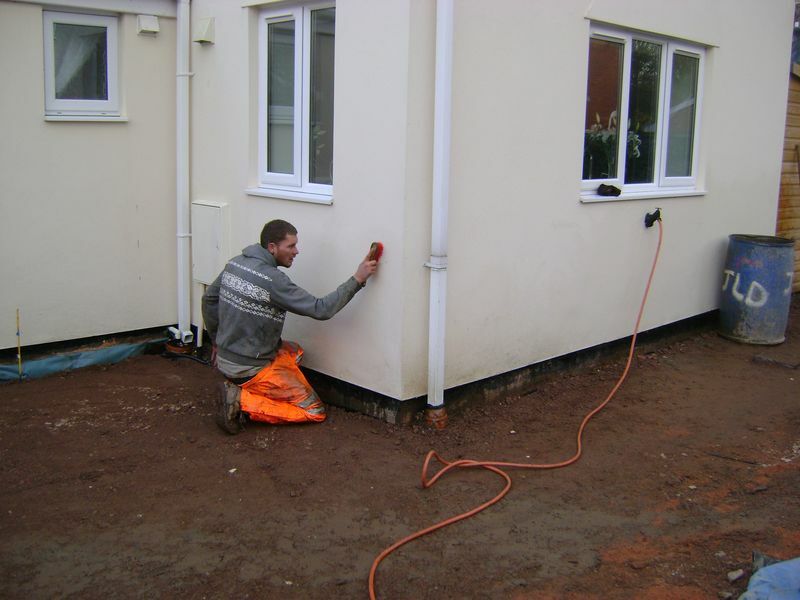 I believe firmly that if the groundworks are correct then so the landscaping build project will run smoothly, after all the entire landscaping works comes up off the groundworks. The colour coded ducting spurs are wrapped each end with plastic so theres no chance of sub base, concrete or any other material falling into the duct and causing me problems once its time to feed the electric cable inside. The ducting spurs will be connected to the main line of the ducting at a later date. The simple colour coding will assist the electrician. I’m running the wacker plate over the sub base as the weekend is virtually upon us, this is whats known as sealing the sub base, Ok, so we all know it wont seal a pourous sub base its just a common trade practice. In order to have a flying start for Monday we have loaded out 200 blocks, All the block stacks have a covering, have you tried to lay wet concrete blocks, it’s not a good practice when the mortar is oozing out every where.